Scattered throughout the pancreas are small groups of specialized cells called islets, also known as islets of Langerhans (Fig. 8-8). These cells make up the endocrine portion of the pancreas. 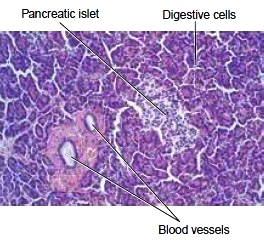 The cells surrounding the islets secrete digestive juices. They make up the exocrine portion of the pancreas, which is independent of the islets and secretes through ducts into the small intestine. The most important hormone secreted by the islets is insulin. Insulin is active in the transport of glucose across plasma membranes, thus increasing cellular glucose uptake. Once inside a cell, glucose is metabolized for energy. Insulin also increases the rate at which the liver takes up glucose and converts it to glycogen and the rate at which the liver changes excess glucose into fatty acids, which can then be converted to fats and stored in adipose tissue. 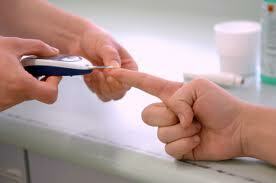 Through these actions, insulin has the effect of lowering the blood sugar level. Insulin has other metabolic effects as well. It promotes the cellular uptake of amino acids and stimulates the manufacture of these amino acids into proteins. A second hormone produced by the islet cells is glucagon, which works with insulin to regulate blood sugar levels. Glucagon causes the liver to release stored glucose into the bloodstream. Glucagon also increases the rate at which glucose is made from proteins in the liver. In these two ways, glucagon increases blood sugar. Figure 8-8 Microscopic view of pancreatic cells. Lightstaining islet cells are visible among the many cells that produce digestive juices. * Insulin-dependent diabetes mellitus (IDDM) is less common but more severe. It is also known as type I diabetes (formerly known as juvenile diabetes). This disease usually appears before the age of 30 years and is brought on by an autoimmune (self) destruction of the insulin-producing cells in the islets. People with IDDM need close monitoring of blood sugar levels and injections of insulin. * Non-insulin-dependent diabetes mellitus (NIDDM), or type II diabetes, characteristically occurs in adults, although the incidence has gone up considerably in the United States in recent years among younger people. It is typically associated with overweight in both adults and children. These people retain the ability to secrete varying amounts of insulin, depending on the severity of the disease. However, the ability of their body cells to respond to the hormone is diminished. This disease can be controlled with diet, oral medication to improve insulin production and increase its effectiveness, and weight reduction for the obese patient. Treatment with injectable insulin may be necessary during illness or other stress. Diabetes that develops during pregnancy is termed gestational diabetes. This form of diabetes usually disappears after childbirth, although it may be a sign that diabetes mellitus will develop later in life. Gestational diabetes usually affects women with a family history of diabetes, those who are obese, or who are of older age. Diagnosis and treatment are important because of a high risk of complications for both the mother and the fetus. Diabetes may also develop in association with other disorders, including pancreatic disease or other endocrine disorders. Viral infections, toxic chemicals in the environment and drugs may also be involved. * Abnormal fat metabolism. Low insulin levels result in the release of more fatty acids from adipose cells. The liver converts the fatty acids into phospholipids and cholesterol, resulting in high blood levels of fats and the accelerated development of atherosclerosis (arterial degeneration). * Damage to arteries, including those of the retina (diabetic retinopathy) and heart. Capillaries, such as those in the kidney, are often damaged as well. * Damage to peripheral nerves, with accompanying pain and loss of sensation. Damage to the autonomic nervous system can result in poor stomach emptying. * Decreased transport of amino acids, the building blocks of proteins. This may explain the weakness and poor tissue repair seen in people who have been diabetic for many years. It may also explain the reduced resistance to infection noted in diabetic patients. Careful management of diabetes can reduce the severity of long-term complications. Patients must follow their prescribed diet consistently, take medication as ordered, eat at regular times, and follow a regular program of exercise. Patients on insulin must test their blood sugar regularly. These tests have traditionally been done on blood obtained by a finger prick, but new devices are available that can read the blood glucose level through the skin and even warn of a significant change. A test for long-term glucose control measures average blood glucose during the previous 2-3 months based on glucose bound to hemoglobin (glycosylated hemoglobin or HbA1c) in red blood cells. A need for insulin requires multiple injections during the day. An alternate method for administration of insulin is by means of a pump that provides an around-the-clock supply. The insulin is placed in a device that then injects it into the subcutaneous tissues of the abdomen. People taking insulin injections are subject to episodes of low blood sugar and should carry notification of their disease. Methods of administering insulin by pills or capsules, inhaler spray, or skin patches are still in the experimental stage. Researchers are also studying the possibility of transplanting islet cells to take over for failed cells in people with diabetes.